It’s an understatement to say that the United States is polarized politically and that there’s animosity toward the media. A lot of this has to do with news slant and rampant claims of “fake news.” Whatever the reason, a new poll from the Economist and YouGov illustrates with data that, yes, there is a lot of animosity toward the media. 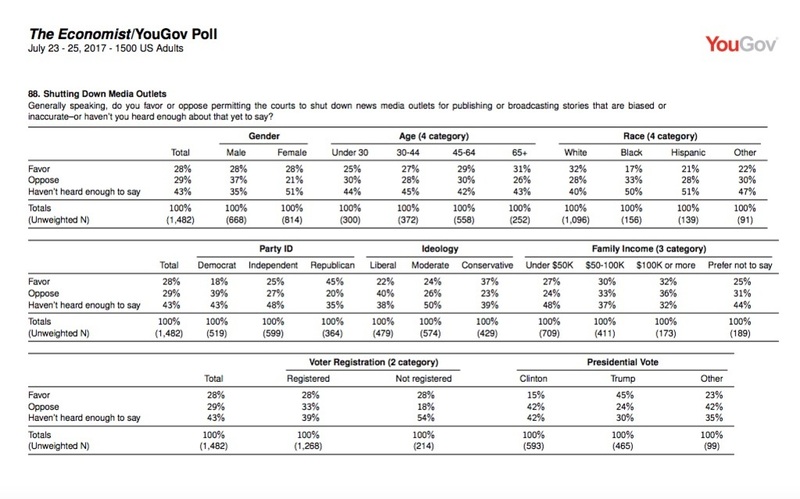 As part of a much larger survey conducted over the web, one poll asked 1,500 Americans if they were for or against “permitting the courts to shut down news media outlets for publishing or broadcasting stories that are biased or inaccurate.” While 28% of the total respondents said they approved of this, 18% of Democrats and 45% of the self-identified Republicans were totally okay with the courts shutting down media organizations. A majority of Republicans, 55%, also said they support fines for media outlets that put out biased or inaccurate news reports, compared to just 12% who opposed the move. If you’re looking for a good thermometer reading on the state of the news media—especially as it suffers regular attacks by Trump—look no further. Things are so polarized that nearly half of the Republicans asked said they’d be okay with the courts infringing on the right to free press. Somewhere, Peter Thiel is chuckling to himself.